Devotion to Mary as Queen of Apostles is one of the oldest devotions in the Church. After Christ and with Christ, Mary is the Apostle. God continues to give all graces through Mary, just as He willed that Christ should come to us through Mary: "born of a woman." (Gal 4:4) Every apostolate and every true apostle has life and action from Mary. So it was of Christ: " ... Jesus, the apostle and high priest of our confession." (Heb 3:1) Christ began his apostolate through Mary at Cana; the mission of the apostles was begun through Mary in the cenacle. Likewise, through the centuries all apostolates have received their origin and strength through Mary. Without God, nothing exists; without Mary, nothing in Christ and in the Church. The feast of the Queen of Apostles was established on the first Saturday after the Ascension by the Sacred Congregation of Rites at the request of the Pallottine Fathers. Mary initiated her mission as Queen of Apostles in the Cenacle. She gathered the apostles together, comforted them, and assisted them in prayer. Together with them she hoped, desired and prayed; with them her petitions were heeded and she received the Holy Spirit on the day of Pentecost. Mary is Queen of Apostles because she was chosen to be the Mother of Jesus Christ and to give him to the world; she was made the apostles' Mother and our own by our Savior on the cross. 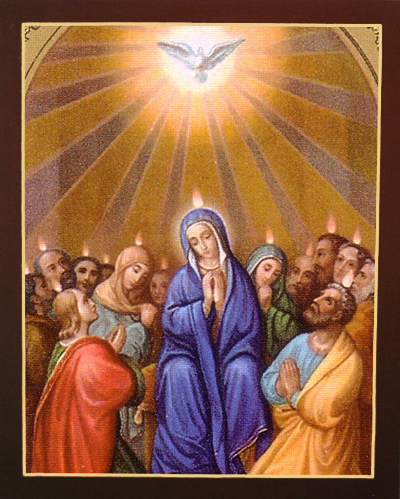 She was with the apostles while awaiting the descent of the Holy Spirit, obtaining for them the abundance of supernatural graces they received on Pentecost. The most holy Virgin was and always will be the wellspring for every apostolate. She exercised a universal apostolate, one so vast that it embraced all others. The apostolate of prayer, the apostolate of good example, the apostolate of suffering--Mary fulfilled them all. Other people have practiced certain teachings of the Gospel; Mary lived them all. Mary is full of grace, and we draw from her abundance. Mary attracts the zealous to the various apostolates, then protects and defends all these works. She sheds on each the warmth of her love and the light of her countenance. She presented Jesus in a manner unparalleled throughout the ages. Her apostolate is of the highest degree--never to be equaled, much less surpassed. Mary gave Jesus to the world and with Jesus came every other blessing. Thus, because of Mary we have the Church: "Mary is the Mother of the Church not only because she is the Mother of Christ and His most intimate associate in 'the new economy when the Son of God took a human nature from her, that He might in the mysteries of His flesh free man from sin', but also because 'she shines forth to the whole community of the elect as a model of the virtues'. (Lumen Gentium. 55, 65) She now continues to fulfill from heaven her maternal function as the cooperator in the birth and development of the divine life in the individual souls of the redeemed." (The Great Sign by Paul VI) What do we have of value that we have not received through Mary? It is God's will that every blessing should come to us through her. Because the Blessed Mother occupies a most important position in God's plan of salvation, all humanity should pay homage to her. Whoever spreads devotion to the Queen of Apostles is an apostolic benefactor of the human race, because devotion to Mary is a treasure. Blessed is the person who possesses this treasure! Mary's devotees will never be without grace; in any danger, in every circumstance they will always have the means to obtain every grace from God. Several religious congregations practice devotion to Mary under the title of Queen of Apostles, including the Pallotines, the Marianists, and the congregations founded by Blessed James Alberione (the Society of St. Paul, the Daughters of St. Paul, and several others). In the twentieth century, Bl. Alberione promoted this devotion in a particular way. "She gave birth to her firstborn son and wrapped him in bands of cloth, and laid him in a manger, because there was no place for them in the inn." (Lk 2:7) Mary fulfills her apostolate: to give Jesus to the Father, to humanity, to heaven. She presented Jesus to the Gentiles, represented by the Magi who came to the crib in Bethlehem. Mary always gives Jesus. She is like a fruitful branch. She always carries Jesus and offers him to us: the Way, the Truth and the Life of humanity. "This child is destined for the falling and the rising of many in Israel, and to be a sign that will be opposed...and a sword will pierce your own soul too." (Lk 2:34-35) Jesus Christ saw Mary at the foot of His cross, sharing in his passion. The Christian possesses an inexhaustible strength and is able to endure great sufferings without breaking. In suffering, a person can attain great nobility of character; indeed, suffering becomes a real apostolate. Let us look at Jesus--He sacrificed Himself on the cross. Let us look at Mary--she shared Christ's mission and passion with Him. The essence of the redemption is on Calvary--Jesus offers Himself; Mary offers herself and her Son, whom she loves more than herself. Jesus is the Redeemer; Mary, the co-redemptrix. After the death of her Son, Jesus, Mary took care of the apostles, especially St. John, the youngest. She accompanied them with her prayers, good example and maternal comfort. Thus, Jesus willed that Mary be with them during their first years of evangelization, as she had accompanied Him. After her earthly pilgrimage, her mission fulfilled, she was assumed into heaven. Let us think about the last day of the world. All the elect will gloriously enter heaven, body and soul; thus they will have an eternal reward. 1. Most loving Queen of heaven and of earth, I venerate and praise that privilege, unique in the world, whereby--pleasing God in your humility and faith, and preserving your spotless virginity--you became the great Mother of the divine Savior, source of all truth and first apostle of truth. You gave the world the Book to read: the Eternal Word. For the indescribable joy you felt and for that privilege so sublime, I bless the Holy Trinity. I ask you to obtain for me the grace of heavenly wisdom, to be a humble and fervent disciple of Jesus, a devoted child of the Church, the pillar of truth. Make the light of the Gospel shine to the farthest bounds of the earth, overcome errors, gather all people around the See of Peter. Enlighten theologians, preachers and writers, O Mother of Good Counsel, O Seat of Wisdom, O Queen of all saints. 2. O Mary, Queen of all the angels, full of grace, conceived without sin, blessed among creatures, living tabernacle of God, remember that painful and solemn moment in which the dying Jesus from the cross gave you John as your son, and in him all humanity and especially all the apostles. What tender love flooded your heart at that moment for those consecrated to the apostolate, to the following of the cross, to the love of Jesus! For your indescribable sufferings and those of your divine Son, for your motherly heart, O Mary, increase the number of apostles, missionaries, priests and virgins. May they be resplendent for sanctity of life, integrity of morals, solid piety, the deepest humility, the most firm faith, the most ardent charity. May they all be holy, purifying salt of the earth and light of the world. 3. O Virgin most pure, noble Queen of Martyrs, Morning Star, safe refuge of sinners, rejoice for the days in which you were teacher, comforter and Mother of the apostles in the cenacle, to invoke and receive the divine Paraclete, the Spirit with the seven gifts, Love of the Father and of the Son, transformer of the apostles. By your all-powerful intercession and by your humble and irresistible prayers, which always move God's heart, obtain for me the grace to realize the value of every human person, for whom Jesus Christ shed his most precious blood. May each one of us be enthusiastic about the beauty of the Christian apostolate. May the charity of Christ urge us on. May the spiritual misery of poor humanity move us. Grant that we may feel in our hearts the needs of childhood, of adolescence, of adulthood, of old age. Grant that vast Africa, immense Asia, promising Oceania, troubled Europe, the two Americas may exercise a powerful attraction on our souls. Grant that the apostolate of example and word, of prayer and the press, of films, radio and television, of the souls in purgatory, may conquer many generous persons, even to the point of the most heroic sacrifices. O Mother of the Church, O Queen of Apostles, our Advocate, to you we sigh, mourning in this valley of tears. 4. O our tender Mother Mary, gate of heaven, source of peace and happiness, help of Christians, trust of the dying and hope even of the desperate, I recall the blessed moment for you in which you left the earth to fly to the blessed embrace of Jesus. It was the omnipotent favor of God which assumed you into heaven, beautiful and immortal. I see you exalted above the angels and saints, confessors and virgins, apostles and martyrs, prophets and patriarchs, and even I, from the midst of my sins, dare to add the voice of an unworthy but repentant sinner to praise and bless you. O Mary, convert me once and for always. Give me a repentant life, that I may have a holy death and one day join my voice to that of the saints to praise you in heaven. I consecrate myself to you and through you to Jesus. With full awareness and here in the presence of all the heavenly court, I renew the promises made in holy Baptism. I renew the resolution, which I place in your heart, to fight my self-love and to combat unceasingly against my principal defect, which so often has cast me into sin. O Mary, gain for yourself the greatest glory: change a great sinner into a great saint, O refuge of sinners, O morning star, O comforter of the afflicted. 5. O Mary, Star of the Sea, my gentle sovereign, our life and Queen of Peace, how great and how wonderful the day on which the Holy Trinity crowned you Queen of heaven and earth, dispenser of all graces, our most lovable Mother--what a triumph for you! What happiness for the angels, for the saints, for the earth, for purgatory! I know, O Mary, that those who love you will be saved, and that those who love you greatly will be holy and will participate one day in your glory in heaven. I do not doubt your clemency nor your power; I fear my inconstancy in praying to you. Obtain for me perseverance. O Mary, be my salvation. I feel my passions, the devil, the world. O Mary, hold me close to you and to your Jesus! Do not permit me to fall; do not leave me even for an instant, O Mother. It is consoling to cast the first glance upon you in the morning, to walk under your mantle during the day, to fall asleep under your gaze at night. You have smiles for innocent children, strength for struggling youth, light for working men and women, comfort for old age awaiting heaven. O Mary, to you I consecrate my entire life; pray for me now and in the final battle at the hour of my death. Receive my soul when it breathes its last, and do not leave me until I kneel before your throne in heaven, to love you for all eternity. O Mary, my Queen, my advocate, my sweetness, obtain for me holy perseverance. Taken from Favorite Prayers and Novenas, copyright 1997 Pauline Books & Media. Used by permission.